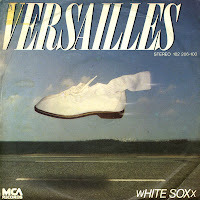 White Soxx was a project by French musicians Frederic Mercier and David Fairstein. As far as I know, the single 'Versailles' was the only thing they released. It was recorded in 1980 for MCA Records, and barely missed the Dutch Top 40 in August 1981. Since 2002, the song appears in the Top 2000 chart of all times, which is compiled by listeners of Dutch Radio 2 at the end of each year.